Whether on the ranch, oil field or construction site this is the hard hat you've been waiting for cowboy! Over 100,000 occupational head injuries are reported every year! Yet, 84% of workers who suffered impact injuries to the head were not wearing head protection, according to a Bureau of Labor Statistics survey! 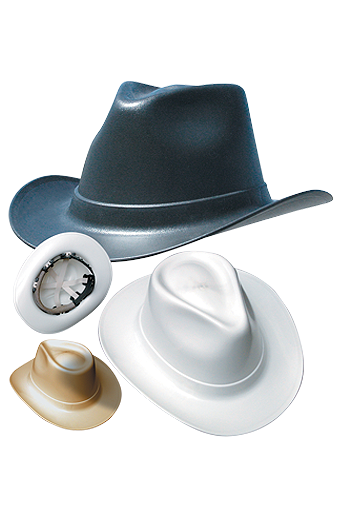 OccuNomix American classic Cowboy Hard Hat will spur your workers to wear their head protection even when the foreman's not around. Compliance: ANSI Z89.1, Type I, Class E, G & C.
Outer shell is made in USA of high-density polyethylene that resists penetration, deflects blows to the head from falling objects, reduces danger from exposure to low and high voltage electrical conductors, is slow burning and water resistant. 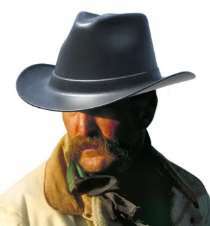 VCB200 features a custom curled extra wide brim for more UV and rain protection than standard or full brim hard hats plus a vintage inspired pinch-front top for authentic appeal and a date of manufacture embossed into the inside shell. The Vulcan Cowboy Hard Hat ratchet suspension (VCB201) features an ultra soft yet strong, super comfortable, 6 Point woven nylon web - crown strap system that acts as a rugged shock absorber with six load-bearing points to spread impact over a larger area, and stabilize the Hard Hat. Suspension also features a "dial your size" to precisely personalize, Ratchet sizing adjustment, in 1/8" increments, and is non-irritating. Included FREE with Suspension - a detachable plush cotton terry, laminated over soft foam, Front Sweatband for moisture wicking-comfort and snug fit.Colors: Black, White, Tan and Grey.